I am a beginner in pgrouting. I have two tables in my postgres database. A street table, where each segment (see red line) carries an Id (ogc_fid). Additionally I have a nodes table (see brown points below). Each point also carries a unique Id (ogc_fid). The nodes below do not intersect at overpasses and underpasses. My question: Is there a way to assign the ogc_fid from the nodes table as source and target value to my streets table based on the digitized direction? Does anyone have useful links related to this issue? 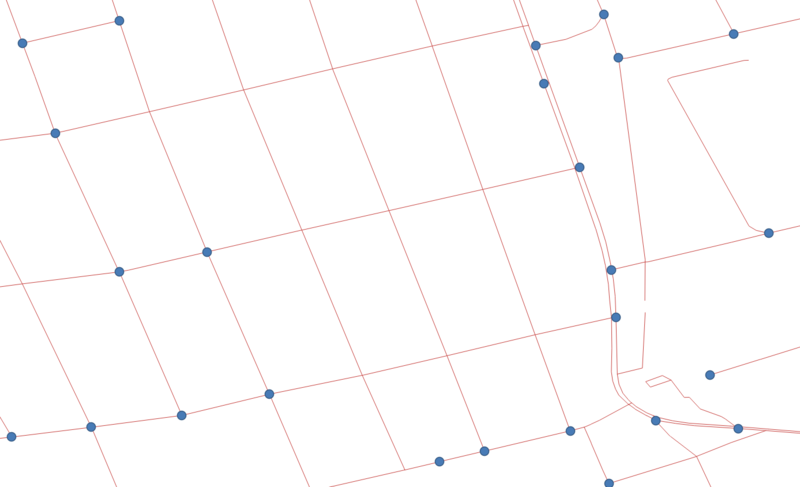 pgRouting does not automatically break lines at intersections to create new nodes. As far as I am aware, it also does not allow you to "ignore" intersections that are already noded. However, the first problem provides an indirect solution to the second, because if you make two lines cross without breaking them into a node, they will not be connected and accurately model an over/underpass scenario. You will have to pre-process the data to clean it of topological problems. 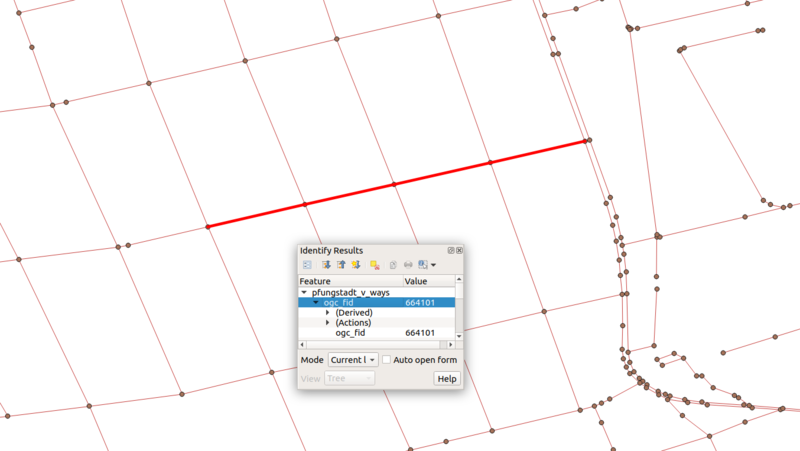 v.clean is available in QGIS (which I can see you are using from the screenshots) and can be used with tool=break,snap to node all the intersections. However, you will have to go back and "de-node" the aforementioned under/overpasses to keep them semantically valid. Not the answer you're looking for? Browse other questions tagged postgis postgresql pgrouting routing or ask your own question. Why is pgRouting shortest route function complaining about wrong source and target IDs? segment lines according to point using pgRouting? How to find routes between for each entry in a list of point pairs?